A few Summers ago, I spent a Labor Day weekend with my family in Galveston. One of the highlights was looking out at the water and seeing an interesting dark shape on the horizon (in a scene very close to the one depicted on the bottle). After a few seconds, it dawned on me that I was staring at a tall ship. Seeing something so ancient looking juxtaposed against the modern world was something really special. I'm sure if I had been 15 years younger, that I would have thought it was a pirate invasion for sure. The tall ship was the Elissa, a barque from 1877, and a major Galveston attraction. 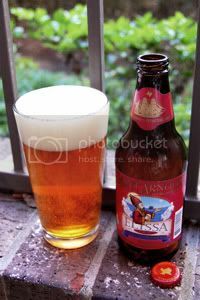 When Saint Arnold decided to try their hand at brewing an IPA a few years ago, they decided to name the beer after the Elissa. Not only was it a perfect tribute to a local landmark, but the Elissa was exactly the kind of ship that transported IPAs to India in the first place. Saint Arnold also donates a portion of their proceeds from this beer to help preserve the Elissa. Released back in 2004, Saint Arnold's first IPA was finally able to exist once a reverse osmosis system was installed in the brewery to strip out the high levels of calcium carbonate levels here in Houston's water supply. They decided to use only one hop variety in the beer, my favorite hop variety, the Cascade. The Cascades are added three times throughout the brewing process and then once as a dry-hopping in the fermenter. The beer is unpasteurized and contains no additives or preservatives. Every now and then, the brewery takes a portion of Elissa, dry hops and cask conditions it for a traditional Real Ale experience in local pubs. Back when I was first experimenting with good beer, this was the first IPA I tried. At that point, I had no idea what an IPA was - I just knew that the Elissa was awesome and every Saint Arnold beer I'd sampled up to that point was brilliant. I took the six-pack home and promptly poured a glass. BAM! It hit me in the mouth with a massive bitter punch, the hoppiest beer I had ever had by far. To be perfectly honest, it was quite unpleasant at first, and it took quite a while to finish that first glass. As I slowly worked my way through the six-pack over the course of a few weeks I got somewhat used to it, but it was still rather extreme. Of course today, it's just a good session beer for me; something to pick up when I'm in the mood for hops but not after a big beer. This beer is a constant reminder of how much your palate changes on this journey. Appearance: An ever-so-slightly hazy, bright golden-amber body with a mass of bubbles working their way up. On top, a finger of dimpled and fluffy off-white head with brilliant retention and good lacing. Aroma: Citrusy, floral, and piney Cascade hops over a solid biscuity caramel malt base. Inviting. Taste: In the flavor profile, the hop character is made up of mild bitterness and leafy notes with a good bit of the citrus stripped out. I'd like to see more of the perfumey citrus flavors you usually get from Cascade hops, but what is left is nice. The malt backbone is biscuity and mildly roasted. This is a very balanced IPA, but I'd be happy to see a bit more focus hop character. The aftertaste is bitter and biscuity. Mouthfeel: Medium-bodied with a good amount of carbonation. Mildly dry. Drinkability: Well above average for the style. One of the most sessionable IPAs I've tried. Verdict: Elissa is just an easily drinkable, moderately hoppy beer. It's certainly not the hoppiest IPA out there, and I'd like to see more of the traditional Cascade character, but it makes for a brilliant session beer for hop fans. A Houston institution in the making.